Located on the NE side of Tallahassee and contiguous with the northern boundary of Killearn Estates, Killearn Acres serves up median priced homes (and up 20%) in a high-demand location. Killearn Acres is a great solution for both first-time home buyers and investors who are seeking stable rents with long-term property appreciation. In this report, we will examine recent trends for home prices, home values, and sizes of homes in Killearn Acres, as well as show current listings in the Tallahassee MLS and all closed home sales going back to 2002. 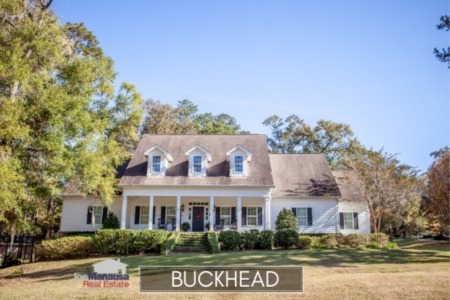 The Killearn Acres Home Owners Association website contains news, updates, and documents pertinent to people who are living there or who are considering moving there. You can find the HOA website here. For the real estate graphs found in this report, you can observe the number of closed home sales for each year (blue columns, measured on the left vertical axis), and an important real estate statistic shown in red (measured on the right vertical axis. It is important to note that sales are through December for all previous years, but through mid March in 2014. Average home prices dipped 8% in 2014 versus 2013, but have recovered nicely thus far in 2015. Home prices are currently 27% below the peak of the market prices established in 2006. Distressed home sales are occurring at a rate a bit higher than other neighborhoods in Tallahassee are seeing, and this certainly has a negative impact on the average home sales price. 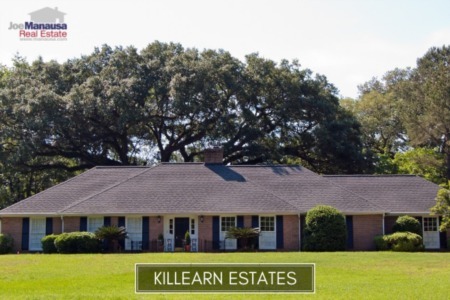 The average recorded sales price is $167,500 for Killearn Acres thus far in 2015. Home sales activity last year was consistent with what we have seen over the past seven years, but still well below the levels recorded during the most active years from 2002 through 2006. Thus far in 2015, there have only been 6 closed home sales in Killearn Acres. Average home values in Killearn Acres have not moved much since 2013, maintaining about $100 per square foot since hopping up from the bottom in 2012. Through March, the average value of a home sold in Killearn Acres has been $100 per square foot. This is up 5% over the bottom reached in 2012, but still down about 24% from the market high set back in 2007. This means that many homeowners who have purchased or refinanced in the past 10 years have no equity in their homes. The average home size sold in Killearn Acres typically falls in a range of 1,450 to 1,750 square feet, and this year buyers have been selecting the larger homes. The 6 sales thus far in 2014 have averaged 1,680 square feet. The following list of homes are the most recent listings in Killearn Acres. The following list shows home sales going back to 1991 in Killearn Acres. I hope you enjoyed our March 2015 update on home sales in Killearn Acres, please feel free to drop me a note if you have questions not covered in this report.